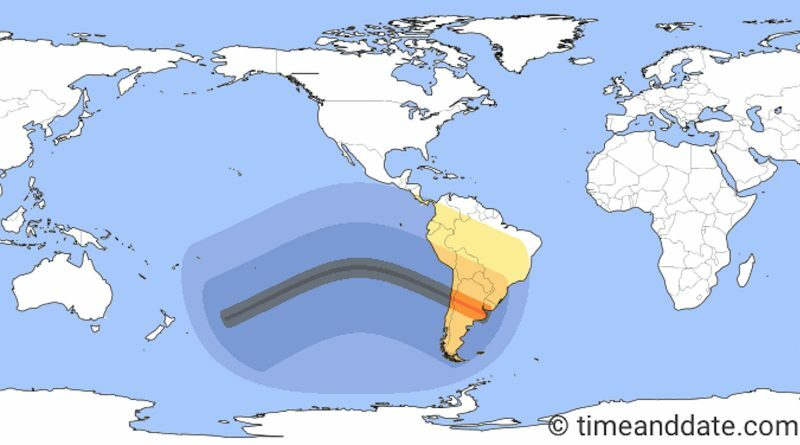 It's 500 days until the Great South American Eclipse - When Is The Next Eclipse? It’s now only 500 days until the Great South American Eclipse! The next total solar eclipse in North America is not until 2024, and Europe won’t experience one for many decades. 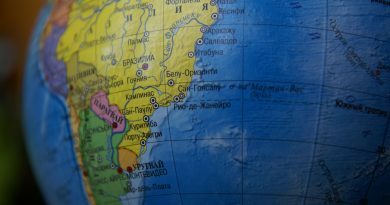 Luckily, there are two stunning total solar eclipses coming up; the Great South American Eclipse (Part 1) sweeps over Chile & Argentina, as well as the South Pacific. As luck would have it, another one will be visible from these same areas just 18 months later. It’s possible to view this eclipse from near the remote Pitcairn Islands, from close to a bunch of international telescopes in Chile’s Elqui Valley in the southern Atacama desert, and from Argentina’s remote Cuyo highlands and agricultural Pampas regions. If you want to take a risk, or you’re after the stunning – but elusive – spectacle of an eclipsed sunset, travel just south west of Buenos Aires in 2019. An eclipsed sun will rise some way south of the Cook Islands and French Polynesia, cross a tiny speck of land called Oeno Island, north of the Pitcairn Islands, than traverse thousands of miles of the South Pacific on its way to Chile and Argentina. A remote volcanic archipelago in the South Pacific, Pitcairn is the only inhabited island, and the scene of one of maritime history’s most intriguing stories; the Mutiny on the Bounty. The Pitcairn Islands are just south of the eclipse track, so Totality will be viewed at sea (approx. 24° 59.1 S / 133° 39.6 W) by cruise ships, and experienced for over three minutes. TravelQuest’s South Pacific Cruise to Totality is one already on sale. After hitting land at La Serena, totality will come to the Elqui Valley in Chile – home to some enormous telescopes. Amateur astronomers are going to want to visit – or at least see from a distance – these giant telescopes of the European Southern Observatory (ESO), though only one – La Silla – is in the path of the eclipse, and the Cerro Tololo Inter-American Observatory (CTIO) in the Elqui Valley had already made the decision to all but close. 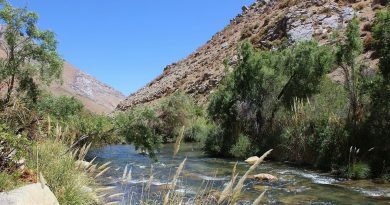 The Elqui Valley is a beautiful place in its own right; about 90 km from La Serena and 470 km north of Santiago, the Elqui River flows through this area on its way from the Andes. Eclipse-chasers should familiarise themselves with Highway 41, which winds its way to the Argentinian border; a turn-off just before Varillar takes you south to the towns of Paihuano, Montegrande, Pisco Elqui, Cochiguaz and Horcon. 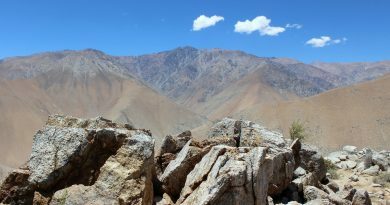 Just south from Pisco Elqui is Horcon. Many a trip to the Elqui Valley will involve a stay at an ‘astro’ hotel, but only one allows you to stargaze from your bed; the Elqui Domos hotel in Horcon. It offers astronomically-inspired accommodation in a mix of geodesic domes or stilted wooden houses with glass ceilings. However, there are other even better equipped domes on the premises for more informed private stargazing; two motorised domes that house Schmidt-Cassegrain telescopes. A corridor going south along Highway 36 from busy Córdoba take you into the Path of Totality, with some options for accommodation along the way. This could be the top choice for independent eclipse-chasers in Argentina. Villa General Belgrano, 90 minutes south of Córdoba, has a lot going for it for eclipse-chasers. This lush, green town is right on the northern limit of the Path of Totality, and will experience a brief 30 seconds of Totality, so would make a place to stay (and there are many hotels here). You could drive further south down Highway 36 to intercept the centerline of the eclipse track at Alcira Gigena. Another option would be to base yourself in Río Quarto, Which lies in the Path of Totality south of the centreline. Population 144,000, this town is a commercial and agricultural hub surrounded by hilly, fertile grassland in the Humid Pampas. It’s about 2 hours drive south from Villa General Belgrano. Tour groups in Argentina will almost certainly base themselves here. Travel with us to the 2019 Total Solar Eclipse in Chile!